Camp is finally underway and Kerem could not be more excited. In preparation for their position as leaders of the camp, they visited the Browne Center ropes course on Monday. 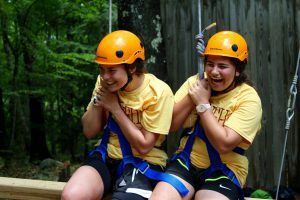 After dividing the aydah into 3 groups, we were led by the Browne Center staff through many different activities designed to challenge the campers and encourage them to step out of their comfort zones. 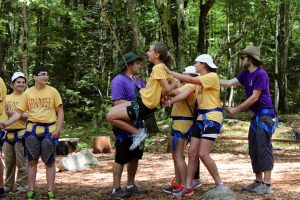 From a blind-folded maze to walking across a log 30 feet in the air, the day revolved around trust, support, communication, and, of course, fun. Opening day was a huge success and Kerem did a fabulous job of welcoming campers- old and new, bringing luggage to bunks, and fundraising for the York Beach Cancer Walk for Hope. After selling loads of popcorn and kippot to support breast cancer research, Kerem ’15 introduced themselves to the camp with a funny video and dance. We can’t wait to see what great things Kerem has in store for this summer!